An additional source of coenzyme Q10 and ascorbic acid. It promotes body general health improvement, improvement of energy metabolism in body cells, retards processes of body ageing. It has antioxidative properties. Whey – 117.0 mg, lactose – 96.0 mg, coenzyme Q10 – 60.0 mg, ascorbic acid – 15.0 mg, calcium stearate – 9.0 mg, Aerosil – 3.0 mg.
Coenzyme Q10 (ubiquinone) is a vitamin-like substance, which is present in all the live cells of the body, which is not only received with food, but is also synthesized in the body. Coenzyme Q10 participates in the process of energy production in cells, and is the most important element of protection systems of cellular structures in the human body. Coenzyme Q10 is concentrated in mitochondria, where energy is produced by way of aerobic respiration for supporting vital activity of the body. The greatest amount of CoQ10 is found in heart and liver cells, where energy requirements are the highest. In addition to cellular energy production, coenzyme Q10 participates in antioxidant protection of the body, whereby active form of coenzyme Q10 is regenerated by the body and the CoQ10 molecules are used several times. Positive effect of Q10 on skin structure lies in its providing for elasticity and flexibility of the skin, hampering loss of fatty acids from the skin. 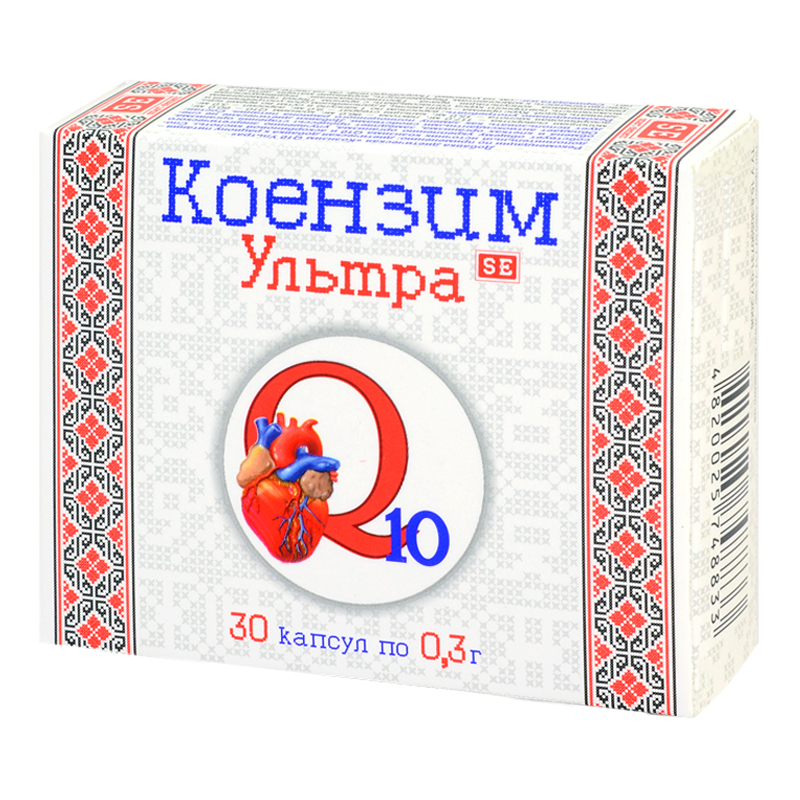 CoQ10 level in the body is reduced sharply with age. CoQ10 deficiency and reduction of its synthesis can also be caused by various illnesses, intake of some drugs, increased physical loads. CoQ10 level reduction results in rapid fatigability, heart functioning impairment, decrease in immunity. Ascorbic acid is an active participant of regulation of oxidation-reduction processes in the body, regulates carbohydrate metabolism, blood clotting process, tissues regeneration, reduces vascular walls permeability, has expressed antioxidant properties. Ascorbic acid increases body resistance to infections, promotes recovery of immune system. Adults take 1 capsule a day with food. Take with sufficient amount of water. Term of use is one month, further, the term of use and the possibility of retreatment are to be agreed with a doctor. Proteins – 1.28 g, carbohydrates – 6.3 g, fats – 0.148 g.